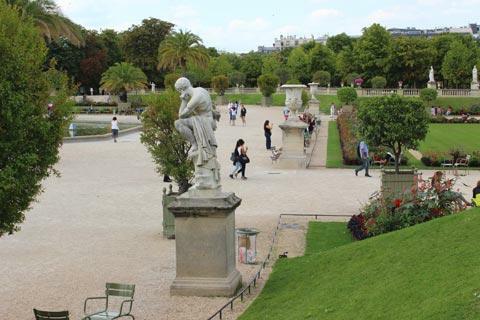 The Jardin de Luxembourg, and the adjacent Palais de Luxembourg, are one of the most popular attractions in southern Paris as well as being one of the largest and longest established public parks in the city. At the beginning of the 17th century, Marie de Medici was left a widow by the murder of her husband King Henry IV. This left her dwelling on the past and her childhood and she decided she would like a palace similar to the one where she had grown up in Italy, the Pitti Palace at Florence. 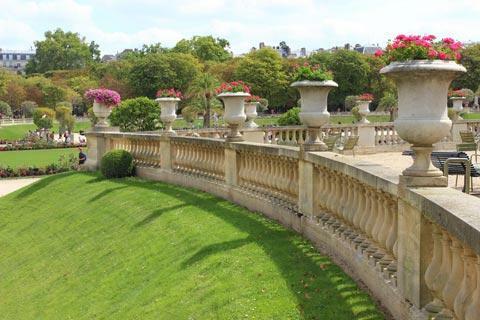 The result was the Palace du Luxembourg, which takes its name from the Duke that previously owned the land here. The end result was a palace that is more French in style than Italian, after the architect managed to reach a compromise with Marie de Medici over its design, but it is very grand and we can only hope that Marie de Medici wasn't too disappointed. Those familiar with Italian architecture will perhaps notice that the rings around the columns in the centre of the facade under the clock are rather Tuscan in style. In any case Madame Medici was sent into exile after a series of family squabbles and power struggles just a few years after the Palais de Luxembourg was completed so perhaps it doesn't matter either way. 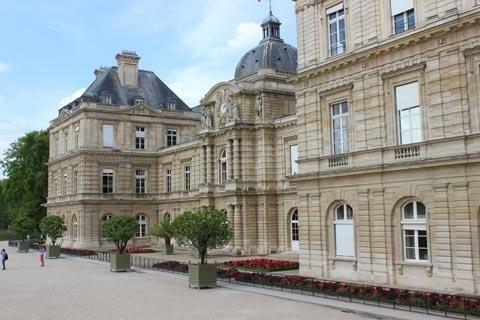 The Palais du Luxembourg has been the base for the French Senate for the last 160 years, and is not generally open to the public (occasional visits by rendezvous only) but still provides an attractive backdrop to the park beyond. 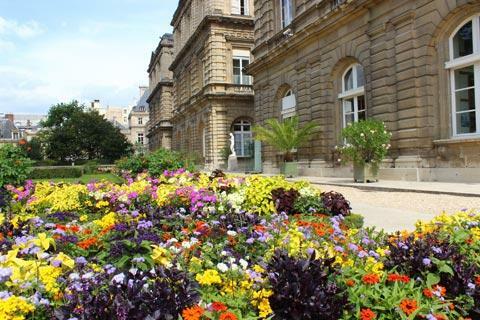 The gardens in the area next to the Palace are filled with attractive flower beds, and one of our favourite features in the Jardin du Luxembourg is also near the palace. 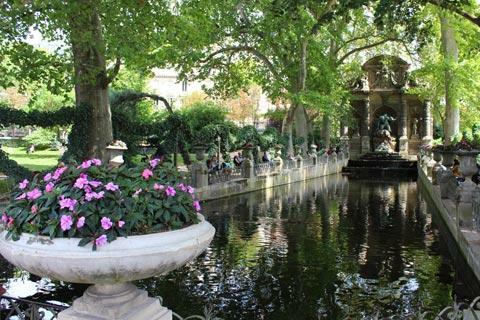 Near the entrance there is a quiet pond in a sheltered position lined with balustrades and large pots and sheltered by trees and with a grand statue in an alcove at one end. This is the Fontaine des Medicis and was built in 1624. 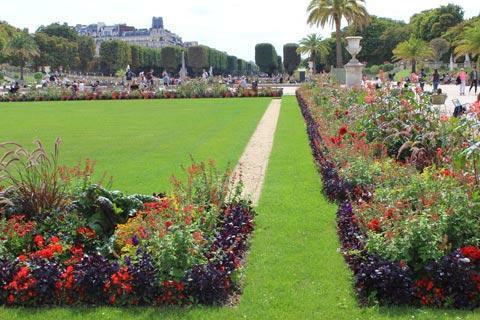 The Jardin du Luxembourg is very extensive and quite exposed to the sun although extensive numbers of trees planted to either side mean it is always easy to find shade. 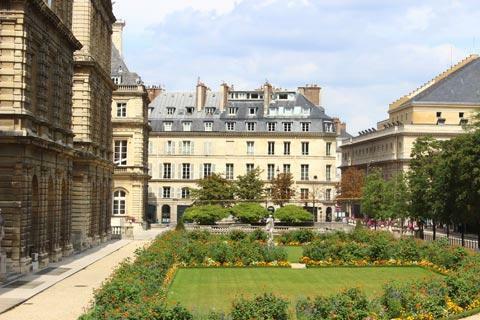 Numerous seats are available so if you do find yourself strolling around the Paris Left Bank, perhaps spending the day walking from the Pantheon to the Eiffel Tower, and are wondering where to eat your picnic this is the perfect spot. The gardens also have a large children's play area. 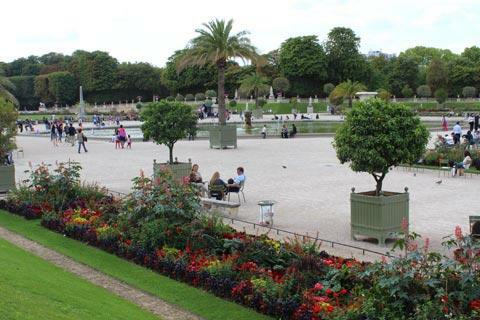 Most of the seats are small chairs that can be picked up and moved around into the shade or into small groups: this helps add to the informal appeal of the Jardin du Luxembourg when compared with more traditional town parks and gardens. 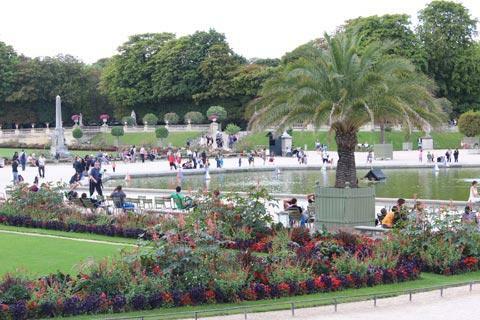 The central part of the Jardin du Luxembourg is a long area of walkways and promenades with small borders, a large pond and a few rows of more formal trees and various statues. Perfectly pleasant but little in the way of 'surprises' to discover, so for me the garden is great for a sit in the shade but less interesting to a garden enthusiast, although the combinations of colours used in the flower beds can be interesting.